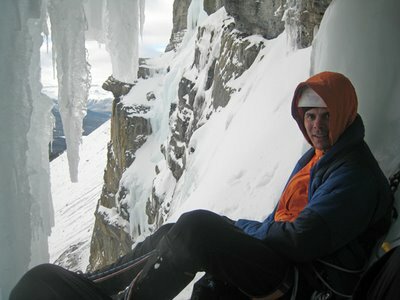 10 years ago Martin Ploug took a 3-month mountaineering course with Yamnuska Mountain Adventures. During the course they attempted to climb Murchinson Falls (180 m, III, WI4+) but had to turn around halfway up due to lack of time. Thus like my craving to return to complete Louise Falls (read story here) he had craved for 10 years to complete this climb. As it was the last day in Banff for him, David Brauner and Line Antoft (who took a rest day) we decided to give it a go. Carlos Buhler and his friend Wade wanted to attempt a neighboring route and we thus decided to drive as a convoy up the Icefields Parkway. As we turned onto the highway in Lake Louise we were unpleasantly surprised to find 10-20 cm fresh show on the road. Both parties were in “normal” 2WD cars and we thus debated for a while whether we should turn around and drive to Fields instead. However, David, Martin and I all longed after doing a long route as our last climb together this season so we decided to drive in the tracks on the Icefield Parkway. 15 km before our destination Carlos’ car suddenly stopped working. David (who loves to modify his truck back home) went up to have a look at the engine, but without tools it was hard to do much. The engine room was full of snow and we thus thought that it was either water in the electricity or gas that had caused the problem. After one hour of trying to get the car going Carlos suggested that we drove ahead so we still had a chance to climb the route. 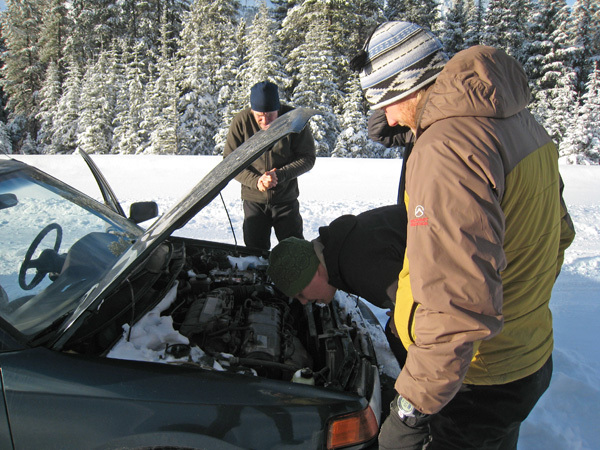 He and Wade would then continue the efforts to get the car going – or hitch a ride home. The access to Murchinson Falls was a bit hard as we were the first to re-break the trail after the recent snow fall. It thus took us 2 hours to reach the base of the climb. We had been a bit concerned about the open snow field leading up to the climb as it is potentially avalanche prone. With the current high avalanche risk we had thus brought beepers, probes and shovels (first time for me on a climb!) 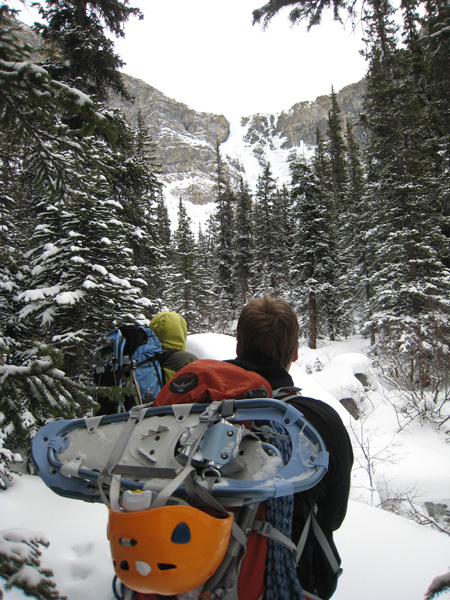 and snow shoes (to spread our weight over a greater surface and thus reduce the risk of triggering an avalanche). 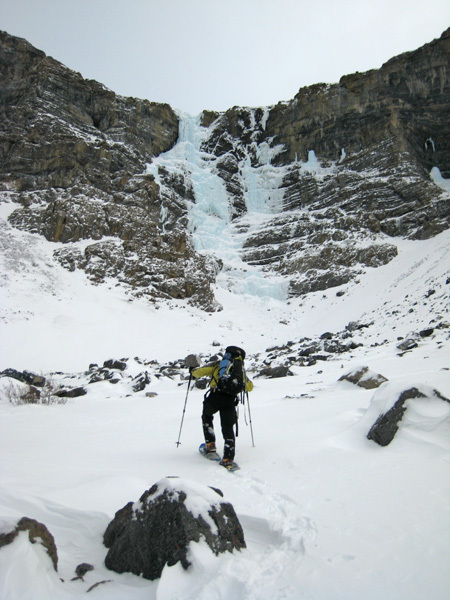 However, when we got to the snow field we were relieved to see that most snow had blown AWAY and that the remaining snow was bonded by rock boulder and ice from the route. Newer the less, it was nice to use the snow shoes to walk across the snow field and it was thus not a complete waste to bring the snow shoes. We soloed the initial easy ice step which enabled us to complete the climb in three pitches. David lead the first pitch into an ice cave on the left. These caves always look so nice from below, but it is becoming my experience that they are often a wet experience with unpleasant traverses when leaving them again. This cave was no exception as it rained with water just outside of it. David leading the route had thus become soaked (wearing soft shells), but luckily I saw the disaster coming and thus speed traversed by the rain and got almost dry into the cave. The crux of the route is the third pitch (which I got as they had led the crux of our last climb This House of Sky) but the second pitch lead by Martin turned out to be equally hard. First it was awkward to get out of the cave and then lead the wet traverse back to the main line. 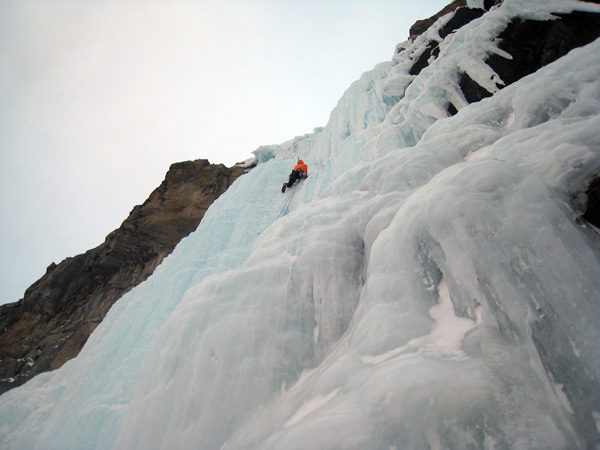 Next followed 15 meter of almost vertical climbing which appeared very exposed as a major piece of the route had fallen of below leaving overhanging ice (which David had circumvented on the left). The overhang made it looked as we were climbing in free air when looking down at the feet. Great exposure! However, we quickly decided to give it a go – we didn’t want Martin to turn around halfway up again! I climbed the crux pitch as fast as possible, trying to avoid the wet ice sections, and swore when I reached the end of the rope thus a couple of meters from the final rock anchor. Why had we chosen to climb with my 57 meter cut-off rope!!!!???? Well, I down climbed to a plateau a few meters down and began making the anchor. As I drilled in the first ice screw it hit a hidden water stream under the ice resulting in a 10 cm high water fountain coming out of the hole. Bugger!!! I tried to plug the hole with snow, ice and a screw but it was impossible to stop the flow completely. I put in two other screws in good ice and cut a hole in a ice curtain which I threaded. When Martin and David had come halfway up the pitch it became too dark to climb without a headlamp. 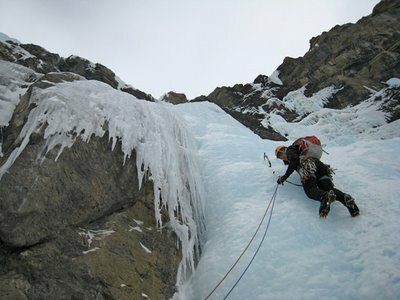 They thus hung from ice screws while putting on the headlamps and then continued climbing. As they got near to the belay I could hear them swearing from getting drenched with water. 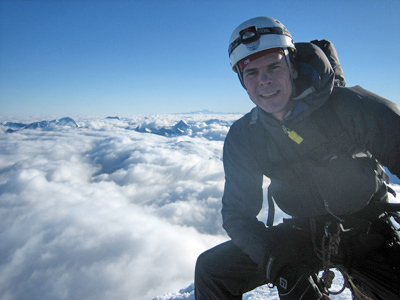 As Martin’s headlight shined on the lip of the belay plateau I could see why – there were two 1 cm wide streams of water running over the lip. I had clearly not been successful in stopping the water from running out of the ice screw hole! As they got to the anchor they were thus wet, cold and in a slightly bad mood. I on the other hand was dry, warm and in a great mood. It had been spectacular to stand at the belay watching the sunset and moon rise over the spectacular icefields. It was a clear night and the moon light reflections in the ice formation was just fantastic. As we began rappelling in the dark, Martin and David regained their good spirit and also enjoyed the spectacular venue and 12 hours after we left the car we were back in its comfort. On the way home we quickly agreed that this had been an awesome route (in spite of the water shower on the last pitch) and a great way to end our two weeks together in the Canadian Rockies. P.S. Carlos and Wade eventually got the car going by cleaning the snow out of the air intake and then went to Field to climb a mixed route behind Pilsner Column. 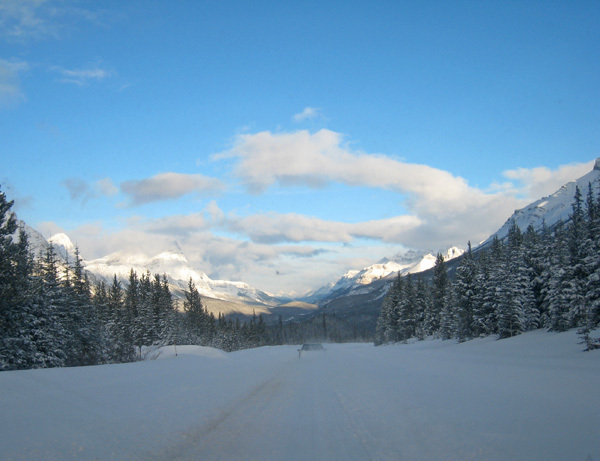 Driving in the snow behind Carlos on the Icefields Parkway. One of the most beautiful mountain ranges on the planet! David looking into the snow filled engine room of Carlos' car trying to figure out whats wrong. Our first look of the route during the approach though the forest. Martin snowshoeing up the snow field below the climb. Luckily, the was only little snow bonded by rock boulders and ice on the potential avalanche slope leading up to the climb. Murchinson Falls with our belays marked. 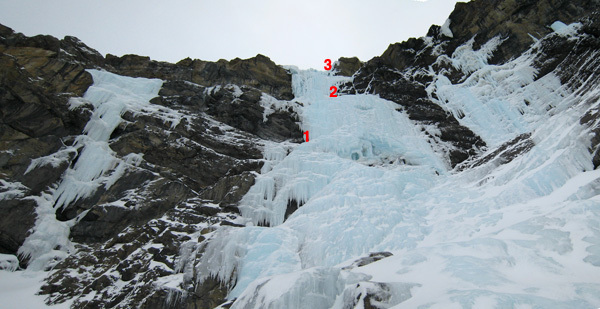 Note the visible rock in the middle of the climb - a big chunck of ice had fallen of. David leading the first pitch. Martin climbing the wet traverse with the "hole" in the ice route on the right. The author in the cave belaying Martin while enjoying the spectacular view. The author leading the final crux pitch. 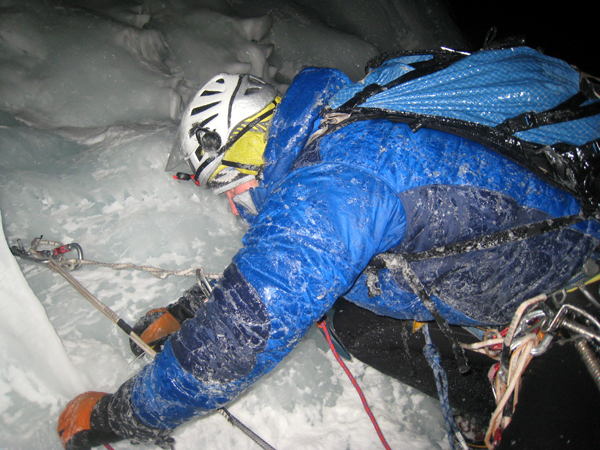 A wet and ice covered Martin building an abalakov rappel anchor in the dark.